The ETS thermal shock chamber is a high quality design with an advanced touch screen controller and an innovative hot/cold transfer system. It is designed to meet strict Mil-Std test specifications, which require temperature recovery to be measured in the worst-case product sample. The touch-screen controller is user-friendly and designed especially for thermal shock. For Mil-Std 883 testing, the controller actually speeds up test time by detecting when the product has achieved temperature and can go to the next step. ESPEC’s electric screw-drive lift automatically moves the samples between hot and cold zones. This direct drive method eliminates the problems associated with cables, pneumatic cylinders, or other complicated mechanisms. 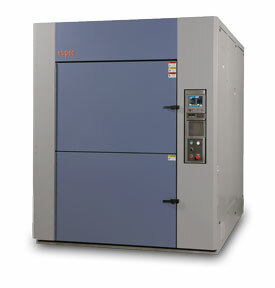 Need something just a bit smaller, or with a smaller footprint?